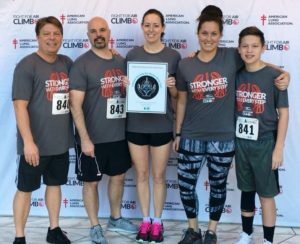 The ALA Fight for Air Climb is completed for 2018 and the Climb results are in the books. March 3 was the date for the annual event; teams and individuals were active with training and fundraising. There were at least 3 teams who featured respiratory therapists and probably more RT’s actually participated. In fact, there were just under 1000 participants with almost equal numbers of men and women. With the somewhat difficult task of climbing 47 stories and over 1000 steps, only 75% finished. 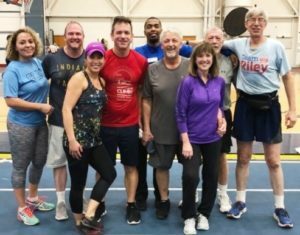 The ISRC was back in action for year #2 and it was a great success with their team of 6 raising over $665 for the ALA event. The Franciscan Health Team with RT participants raised $6100 with 22 team members on board. Jeff Scott, RRT was team captain for the ISRC team and Ricki Shepard, RRT was team captain for the Community Health IT team. Many feats were accomplished and some personal bests acknowledged, but healthcare consumers all over really benefited with strides made towards improvement in air quality and reduced air pollution efforts. Research for lung treatments and lung disease will occur with funds raised. When you participate in a Fight For Air Climb, you are stepping up to make a positive impact in the lives of those affected by lung disease. Participants raise funds to support the mission of the American Lung Association while training to climb the stairs of a skyscraper. Whether you are climbing alone or with friends and family, as a part of a healthy lifestyle or in honor of all those who are affected by lung disease, you will achieve a sense of personal accomplishment as you reach the top of the building and the height of your fundraising potential. Every step taken moves the effort forward in our fight for healthy lungs and clean air. We encourage you to start today and are here to help you, with the first step in your Climb all the way to the top. ALA Fight For Air Climb Boot Camp-ers at NIFS prepare for a Practice Climb on the weekend coming up. Practice Climbs like this one on Saturday, February 3rd, help climbers gauge their progress in training. Fun!